Since Scandal is currently on hiatus, I can only imagine that Olivia Pope is surreptitiously vacationing with POTUS on a private island sipping mojitos, catching up on celebrity gossip, and plotting together on how to hunt and bring down her father. You know, your typical summer vacation shenanigans. Olivia lives in white pants and I imagine she'd pair it with a crisp and airy printed silk blouse during the hot summer months. Simple "don't bother me I'm on vacation" fedora and sunnies completes the Olivia Pope summer look. 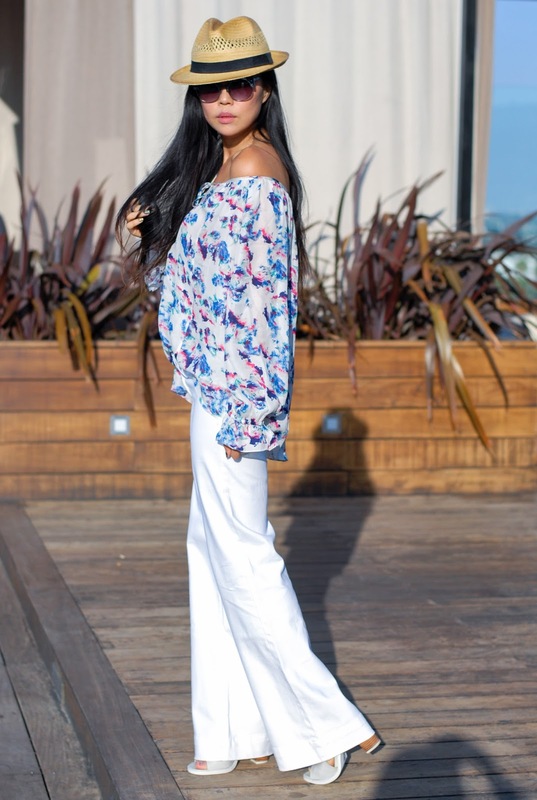 I wore this outfit to a rooftop happy hour with friends from MAC Cosmetics a few weeks ago at SIXTY Beverly Hills. Chatting makeup while noshing on fresh made guac and buttery kale salad may not run parallel to Livvie's summer but I think I'm okay with it. Very nice photos. I Like your style. Keep in touch. I love your hat, I've been looking of a black hat, any recommendations? Beautiful top and colors. So flowy. So pretty and fabulous!! You've got an amazing eye for fashion. I just love the color combinations you chose. It really worked!! I'm a fan!